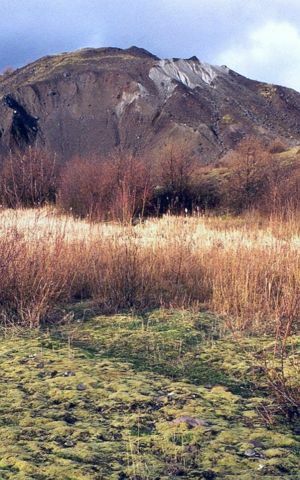 A large hummock on the 1980 landslide deposit from Mount St. Helens stands above a wetland area (foreground) that lies between other hummocks. Hummocks are rounded or conical mounds within a volcanic landslide or debris avalanche deposit. Hummocks contain a wide range of rock debris, reflecting the variation of deposits that previously formed the flanks of the volcano. Some hummocks contain huge intact blocks tens to hundreds of meters in diameter. Some of the original layering of lava flows and other deposits can be seen in these large hummocks, but most of the large rock fragments are thoroughly shattered. In other hummocks the rock debris is thoroughly mixed.